Hats from Joan. Thank you! Hats from Luci. Hats and a scarf from Joan. Thank you both! Received a letter from Tamara at Transition Projects. She said "Thanks to you and your team of expert knitters, our clients have been very warm this season with a constant supply of hats and scarves! The colors and thickness of the items they have been sending are perfect. Please pass along our sincere thanks to the Warmth for All team!" With the many packages of hats and scarves coming in, it has been difficult to record addresses and names of everyone who’s sent items to us. Many of them have gone straight to our shelters without hitting my desk. (: Our staff get excited to see the packages with “Warmth for All” on them. That said, I do want to ensure your team gets tax receipts for their donations if they’d like them. I’m attaching a general letter here that I’m hoping you can forward on to the team. On behalf of Transition Projects, our staff and our clients, thank you for your in-kind donations of hats and scarves in 2018. Thanks to your generosity, we received hundreds of warm clothing items to provide to people sleeping outside. numbers are daunting – and make your generosity all the more timely.  our Housing & Retention Teams - connecting over 1,000 people a year to permanent housing and the support they need to be successful in that housing. touch if you’d like to learn more about what we do or how you can get further engaged. Transition Projects, a 501(c)3 non-profit, has provided no goods or services as a result of or in exchange for this gift. Please keep this letter for your tax records. Our Tax ID# is 93-0591582. January - off to a good start. Hats from Luci! Thanks! This year we collected almost 800 handmade hats and scarves for the homeless! December - items from Twisted - hats, scarves, cowls, etc. Thanks! Also thanks to Brenda & her mother for the infinity scarves! November - items from Twisted, Luci, Joan & Nancy. Thank you everyone! September - a new hat from Joan. Thanks! August - more hats from Luci. Thanks! July - A quilt and hats from Luci. Thanks, Luci! June - hats from Joan, yarn donation from Eileen, hats and other items from Wool 'N Wares customers. Thank you all! Wool 'N Wares is closing its doors at the end of this month. We are sorry to see them go! They have been a great partner for Warmth for All and we are grateful for all their help. May - hats from Joan, hats and a quilt from Luci. Thank you! March - hats from Joan, hats and a quilt from Luci. Thank you! January - Twisted customers - Thank you for the hats & scarves and for the generous yarn donation! The yarns you donated will be made into hats for this coming winter. Also received some hats from Luci this month. And a quilt! Thank you, Luci! November - Quilt and hats from Luci. And hats and scarves from customers of Wool 'N Wares. Thank you!! October - Hats from Joan. Thanks! September - More hats and another gorgeous quilt from Luci. Thank you! July - More hats from Joan! And hats and a gorgeous quilt from Luci! Thank you. May - Hats from Joan. Thank you! April - Handmade items from Wool 'n Wares customers! And from Luci! Thank you all. March - Thanks to Joan & Luci for more hats! February - Hats from Joan, Thanks! January - Thank you to Twisted customers for all the cowls and scarves! And, Luci, thanks for all the hats!! Thank you all for the many handmade items you donated this year. We had over 1,100 items to donate to the homeless and help them stay warm. And we also received a number of donations of yarn - which you will see as hats & scarves as 2017 proceeds. Many thanks! December - More hats from Joan. And hats from Luci. And some hats from Kaps for Kids. And another hat from Joan. Thank you everyone! November - Hats from Joan. Thanks! October - Hats and more hats from Twisted. And hats from Luci. Hats, scarves and sweaters from Wool 'n Wares customers. Thank you all! I drove down to Salem to drop off the baby & children's hats because the Salem chapter can use them. And in return, I got some adult hats and scarves from the Salem chapter and from Nancy Taylor. Much appreciated!! September - More hats from Joan! And more hats from Luci! Thank you both. August - Hats from Joan. Thanks! July - Thanks to Luci for more hats, a headband and a blanket! May - Thanks to Joan for more hats! And thanks to Twisted customers for many hats and scarves! Luci - thanks for the many hats you have donated this month! April - Yarntastic is closing its doors the end of this month! We are sorry to see them close and most grateful for providing us with a drop off location these past three years. Thank you so much, Yarntastic! We will miss you! Thanks to Wool 'N Wares and their customers for the many hats and other items they donated this month. March - Thank you, Luci, for all the hats and headbands!! And thanks to Joan for the hats and scarves! Received more hats from Yarntastic customers - thank you all! Off to a good start for 2016! We have received hats, scarves, cowls, mitts from Yarntastic, hats from Joan, hats & scarves from Twisted, and hats and headbands from Luci. We have a new Warmth for All Chapter in Atlanta, Georgia! They will be collecting items for the International Rescue Committee in Atlanta. Welcome Diane Curtis and the Atlanta chapter of Warmth for All!! 2015 has been our biggest year yet! We received over 1,200 hats, scarves and other handmade items for adults. Some children's items were also received and were passed on to appropriate groups by Transition Projects. The success we have had this year is due to all of you - those of you who made items for the homeless and those yarn shops that provided drop off sites - Twisted, Wool 'N Wares, and Yarntastic. Many thanks to all of you!! December - This promises to be our busiest month of the year. Thanks to Joan for hats & scarves. Also thanks to Carla & Twisted for hats and hat & scarf sets. More hats from Luci! Items from Wool 'N Ware customers - hats, scarves, sweaters, mitts, cowls, and some donated yarn. Hats & mitts from Kaps for Kids! Thank you everyone!! November - this has been an especially busy month so far!! We have received donations from Twisted, Yarntastic, Wool 'N Wares, Nancy and Luci. Thank you all! October - The weather is getting colder here in Portland. Time for hats & scarves! Thanks to Emily for the items she made. And thanks to Yarntastic and the Yarntastic customers for the items they donated. See pictures of all on the photo pages. September - Received a yarn donation from Claudia. Thanks so much! Hats from Luci. Thank you! June - Donations from Yarntastic - hats & scarves. Thank you! Thanks to Tricia for the many hats she donated through Twisted!! April - This is Warmth for All's 5 year anniversary! We started with 493 hats, scarves and other donated items back in 2010 and more than doubled that in 2014. Thanks to all of you!! Thanks to Nancy for hats & cowls, to Joan for hats and a scarf! Nancy Taylor, thanks for the donated yarn!! March - Hats and a scarf from Luci. Thanks, Luci! We have a new drop off site in West Linn - Wool 'n Wares Yarn Shop. Check out their web site here: http://woolnwaresyarn.com/. February - Hats & Scarves received from Yarntastic. Thank you! Hats & a scarf from Joan. Thanks! January - We now have a new chapter in Lebanon County, Pennsylvania. Welcome, Missy Krause!! More items from Twisted!! This is the last collection for Warmth for All for 2014 but don't stop knitting or crocheting. It just means that any items collected after today will go to Transition Projects in 2015. We collect throughout the year; whenever you have items completed and ready for Warmth for All, just drop them at our drop locations or contact Marge to discuss a possible pick up. Received hats and a scarf from Joan; hats and more hats from Kaps for Kids; hats, scarves and other items from Yarntastic, hats & cowls from Twisted. Thank you all! Warmth for All has received many lovely items so far this period. Thanks to Carrie, Joan,Twisted and C.T.! We are still gathering items for 2014. Please drop them off at Twisted or Yarntastic or email me if you need special pick up arrangements. Jere Kennedy of McMinnville for the many hats and the hats & cowl sets! And to Luci for the hats and scarves! Thanks to all the Twisted customers who donated handmade items! Thanks, Ethel! These are great! Thanks for all the donated yarn, too. It will all be used. More hats from Luci, and some others. These will keep some folks nice and warm this winter! Thanks, Nancy! Yarn Garden is going out of business. Their last day will be June 22nd, 2014. Many thanks to Yarn Garden for being a collection point for Warmth for All!!! Hats & scarves from Yarntastic, along with some baby sets. Thank you! Off to a good start for 2014! Picked up some hats from Luci today. We have already received some hats from Twisted & customers. There are 167 of them but they are all for infants or young children. Warmth for All concentrates on adult hats but these will be passed on to Transition Projects so they can be given to an appropriate charity group. There are some beautiful little hats - check out the photo page! I dropped off the last of the Warmth for All hats at Clark Center this past Tuesday. So that's it for this year. I think we topped last year for number of items - had over 1,000! Thanks so much. I guarantee there were over 1000! It is so great to see this program build each year and our clients love the personal touches each person puts into their hats, gloves and scarves. Please pass my thanks along and have a great holiday. The mission of Transition Projects is to serve people’s needs as we assist them in transitioning from homelessness to housing. Thanks to all of you for making such a success of the Warmth for All project in 2013. We received 833 hats, 116 scarves and 85 other items. And this is just an estimate because Yarn Garden sends their collected items directly to Transition Projects and I don't have a count for them. December 16, 2013 - received hats from the Kaps for Kids group. They made 170 hats for Warmth for All this year!! Wow! December 13, 2013 - Hats from Sandy. Last year she made 100 hats for Warmth for All; this year it was 120!! Many thanks! December 12, 2013 - more hats from Yarntastic! December 7, 2013 - hats &scarves from Twisted. Thanks!! Just wanted to pass along this letter from one of the coordinators at our 70 bed women’s warming shelter that is open during the winter months. I passed along a lot of the hats and scarves their way and it sounds like they are really grateful for them. Hope you had a great Thanksgiving. I just wanted to thank you for taking the time to coordinate the making of the lovely scarves and hats that was provided to the ladies here at the warming shelter. The ladies love them, and it truly shows a lot of care and consideration that you were able to bless the ladies with them! Tell your team thank you! Yarntastic customers donated hats, scarves, footies, socks, sweaters, mittens, etc. - many lovely items which I will deliver to Transition Projects tomorrow. Thank you Yarntastic and Yarntastic customers!!! Drove down to Salem and met with Nancy and Ellen. The Salem chapter partners with charities that need children's items so they gave me some adult items that they and the Salem members had made. Thank you!! I wanted to thank you so much for passing along the hats. Each year it seems that more and more knitters are joining your ranks! We are getting them to our residential programs, clothing closet, women’s warming shelter, and now our street outreach team is taking them out with them on their rounds. These hats are reaching so many people who need them. October 26, 2013 - Back at Twisted. More hats, scarves and blankets. A Warmth for All backer in Washington drove down and dropped off items she had been working on and I picked them up at Twisted. Lots of beautiful items which will be greatly appreciated this winter! Thank you Twisted and C.T.!! October 12, 2013 - Met with Luci and Debbie down in Milwaukie to pick up the hats and quilts they made for Warmth for All - 141 hats and 5 quilts!! Such beautiful work! The photos I took don't do them justice but check them out anyway on our photo page. September 21, 2013 - Stopped at Twisted and picked up some more items - 46 hats and 4 scarves. Some of you have been busy!! Thanks so much!! This is a new yarn shop in the Sellwood/Moreland area of Portland at 6802 SE Milwaukie Avenue and they have agreed to be a drop off spot for Warmth for All. Bring the handmade items you would like to donate to Yarntastic, Twisted or Yarn Garden. Thanks! August 2013 - Emma (Okemah) Barton has moved from Vancouver to Arkansas. So - we no longer have a Vancouver chapter of Warmth for All. If anyone from Vancouver would like to start it up again, let me know. Thanks for all your hard work, Emma!! December 15, 2012 - Received more hats since the last posting, hundreds of hats!! In 2012, we received over 800 hats plus more than 100 related items - scarves, cowls, mittens, etc. 905 items in all. Fantastic!!! Many thanks to all of you knitters and crocheters for making this such a great year for the Portland Warmth for All chapter. Whether you made one hat - or 100 hats - it has been much appreciated. Thank you!!! Thank you!!! Thank you!!! November 27, 2012 - Stopped at Yarn Garden to get some yarn to make a ruffle scarf. Yarn Garden had already sent 130 hats to Transition Projects but since I was there, I thought I'd check if they had received any more hats since then. Yes, they did. I left the store with the yarn I bought along with 24 more hats and 2 scarves for Warmth for All. see photos on photo page. November 26, 2012 - Drove down to Salem to meet with Kathy, Ellen & Nancy of the Salem chapter. Had a delicious lunch provided by Ellen, learned how to make a ruffle scarf (Thanks, Nancy! ), and exchanged handmade items that were more suitable for each others' chapters. I brought some stuffed animals to the Salem chapter, and I was given hats! See photos on the photo page. November 19, 2012 - Went to Vancouver to meet with Okemah Barton, the founder of the Vancouver chapter. This was the first time we met. Had an interesting afternoon discussing knitting and crocheting and seeing all the items Okemah has been making. VANCOUVER KNITTERS and CROCHETERS - Okemah and the Vancouver chapter could use your help!!! If you have handmade items you are willing to donate, please contact Okemah at 360-721-8283. November 10, 2012 - Stopped by Make One in Milwaukee to pick up handmade items they had created for Warmth For All. Such beautiful things!! Thank you everyone for your donations!! There was quite a variety of items but all will be most welcome - either by Transition Projects in Portland, FISH in the Vancouver Warmth For All chapter or for foster children at the Salem chapter. Check out pictures of all the handmade items on the Warmth for All photo page. August 19, 2012 - Received hats, hats & more hats from Luci S. Thank you! Thank you! Thank you!! July 28, 2012 - Thanks to Beth D. for a large donation of yarn!! We have knitters & crocheters ready to make use of it. More hats & scarves will be available for the homeless this winter thanks to this kind donation!! Any of you who have yarn to donate - or who need donated yarn - please contact Marge at marge@warmthforall.com. April 21, 2012 - We have a new chapter - Vancouver, Washington! Okemah Barton is the founder of this chapter and she will be working with two charities in the area - Furry Friends (cat rescue - no kill) and FISH (homeless, elderly, low income). Okemah will be collecting hats, scarves, arm/leg warmers, gloves, cat blankets & cat toys. Welcome Okemah & Vancouver!! We are happy to have you join us! January 11, 2012 - Ellen Graham, founder of the Salem chapter of Warmth For All, was headed to Portland so we met today. The Salem chapter is now working with foster children and is collecting items for them - hats, mittens, toys, etc. Ellen had some adult hats and scarves that their chapter no longer needed (see photo page) and she brought them along for the Portland chapter and Transition Projects. The Portland & Salem chapters will be coordinating our efforts with the adult items going to Portland and the children's items to Salem. The Portland chapter will still be concentrating on adult hats, scarves, mittens, etc. for the homeless which will be given to Transition Projects but if children's handmade items are donated, we will gladly accept them too - and send them down to Ellen and Salem WFA. 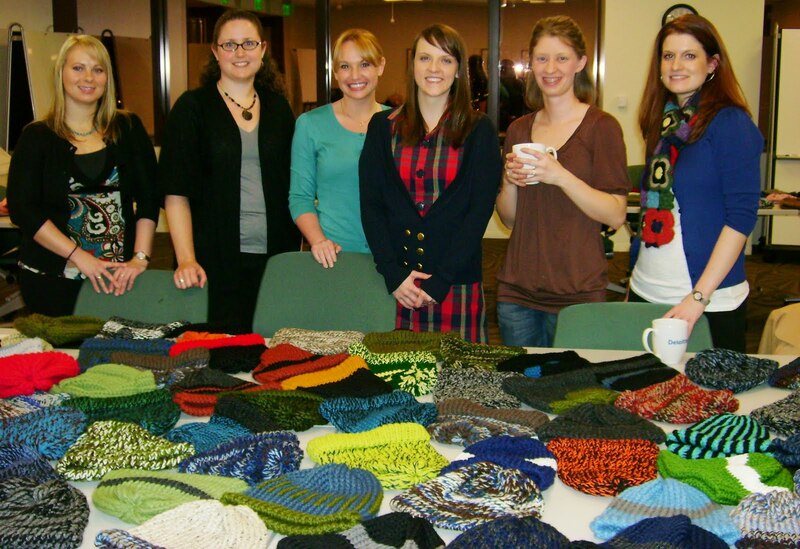 December 13, 2011 - Met with Danielle Barrett and the Kaps for Kids group to pick up the hats they made this year. Total hats we've received this year - over 300!! Thanks everyone! December 12, 2011 - Stopped in at Twisted to pick up their handmade items. Yarn Garden mailed all their collected items directly to Transition Projects. More than 275 items have been made so far!! December 10, 2011 - Picked up items from Make One this morning. More than 80 hats, scarves, socks, mittens and other items!! Some beautiful knitting and crocheting - check them out on the photo page. Thanks Make One and all who donated!! November 2011 - Next month we'll be picking up items at Yarn Garden, Twisted and Make One. Please get your handmade items to these yarn shops by December 10th or earlier. If you find you can't make it there but you do have items to donate, email me at marge.warmthforall.com and we'll work on some pick-up arrangements. Thanks! October 2011 - We will be collecting items for this winter until early December 2011. Please bring the items you've made to Yarn Garden, Twisted, or Make One by then. Keep on knitting and crocheting!! January 22, 2011 - Starting in 2011, making cat blankets for the House of Dreams, a local no-kill cat shelter will be added to Warmth For All goals. Blankets can be knitted or crocheted, should be in the size range of 20" x 20" or 24" by 24", and can be any color or style. Cat blankets are a great beginner project and would also be great for trying a new stitch or pattern - or for any cat-lover. Another addition this year is Twisted, a yarn shop at 2310 NE Broadway. Twisted will be a drop off site for both Transition Project items and for cat blankets. Welcome House of Dreams & Twisted!! December 28, 2010 - Feedback from Transition Projects on Warmth For All "We not only had enough for all three of our shelters to have a beautiful, home-made Christmas gift, but we had enough to share with the women's emergency winter shelter that Transition Projects is currently running as well. Annie, the manager of that shelter was absolutely estatic that she would have a little something to give the ladies on Christmas morning. Thank you, thank you, THANK YOU, for helping us spread some holiday cheer during a time that tends to be less than cheerful around here." Carrie and I made this year's final pickup for handmade items on December 12th. In 2010, Warmth For All gathered 493 hats, 63 scarves, 6 pair mittens or hand warmers, and 6 pair socks. With your help we have definitely reached - and exceeded - this year's goal to provide items for two of the homeless shelters run by Transition Projects. The additional items will be used for their 3rd shelter or for Transition Project's work with other homeless individuals. . Thank you! Thank you!! Thank you!! All of you who made items for Warmth For All are part of the group's success. Special thanks to Yarn Garden and Make One for acting as collection sites for all the handmade items! Above are a few pictures of some of the items collected this weekend. Check out the photo page for others. December 2, 2010 - Met with Kaps for Kids last night and picked up the hats they have made - 87 men's hats and 65 women's hats!!! Here are a few of the members of the group shown with some of the hats they've made. .